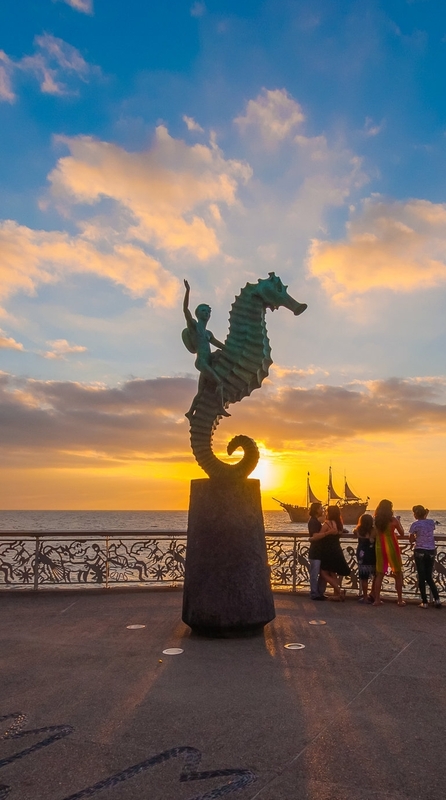 The Malecón, with its romantic seahorse sculpture, in Puerto Vallarta. In addition to the relaxing beaches, the soothing sound of surf, and the wonderful meals you are enjoying at Hacienda Alegre — the areas around Punta Mita offer a wealth of other activities to keep your family and friends entertained! 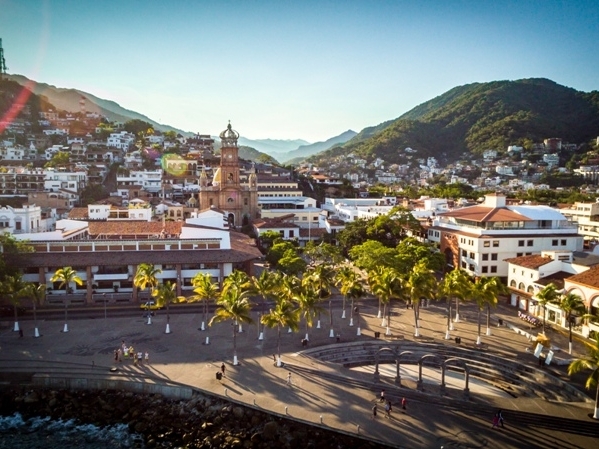 The streets of downtown Puerto Vallarta offer myriad boutiques, shops and galleries. Wonderful eateries, from five-star restaurants to informal beach shacks, offer the freshest seafood and Mexican specialties you will ever find. The city hall has murals painted by Manuel Lepe, and the Malecón (sea wall) is adorned with romantic bronze sculptures. The impressive rock formations of Los Arcos emerge from the bay's crystalline waters, which are great for diving and discovering incredible underwater mountains and steeps. And the village of Mismaloya, where the iconic film The Night of The Iguana was filmed, continues to fascinate. Vista Vallarta, only one of the nine spectacular golf courses in the area. Puerto Vallarta is among the leading golf destinations in Mexico, thanks to the nine wonderful golf courses in the area. Explore these exiciting and spectacular golf courses, located in a variety of terrain – from mountains to rainforest to seaside – including the nearby Punta Mita–Bahia golf course designed by Jack Nicklaus. Superior Tours Vallarta offers a lovely tour of the iconic sites of Puerto Vallarta and surrounding areas, including the downtown, the “zona romantica,” historic churches, Mismaloya (where the famous 1963 movie Night of the Iguana was filmed), and ending with a tasting tour at a tequila distillery. 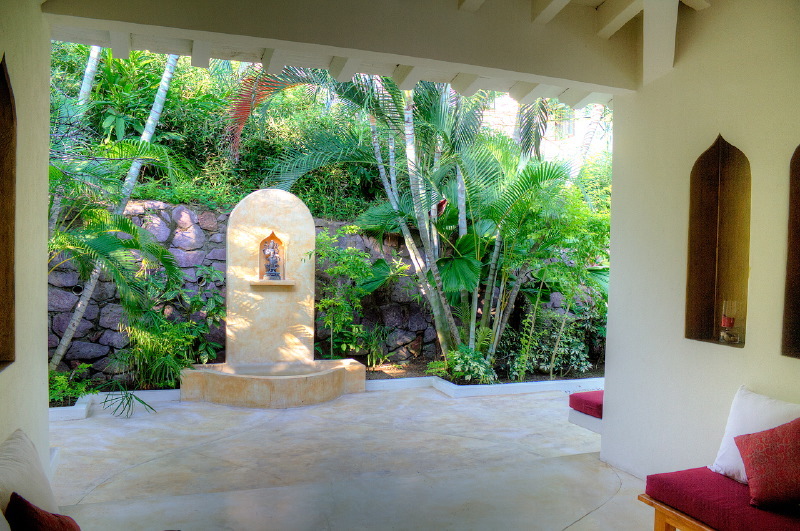 Visit Villa Ananda forAyurveda Day Spa therapies, just minutes from Hacienda Alegre. Ayurveda, India’s traditional system of natural healing, provides the foundation of Villa Ananda. We specialize in Pancha Karma, Ayurveda’s signature program for detoxifying and rejuvenating the body. Snorkel in the beautiful tropical waters of the Marieta Islands. This ecotour operator offers snorkeling and seabird-viewing tours on the pristine Marieta Islands, known as the Mexican Galapagos. Pristine waters and amazing fish and wildlife viewing! Visit nearby beach town Mismaloya, set in a tiny scenic cove, and see where the iconic movie Night of the Iguana, starring Richard Burton and Ava Gardner, was filmed in 1963. Have a drink or lunch in a local hotel, or enjoy swimming or snorkeling. This small gem of a museum, located on an island, has striking exhibitions giving an overview of the peoples who populated the region between 5000 and 2000 B.C. , including their pottery, art and hunting tools. Admission is free. Great option for adventurous kids, teens, and athletic adults! Includes a speedboat ride, mule ride to the top of a mountain, 1000-foot zip line ride; water slide; rope bridge; and rappelling down a waterfall! Great for kids and adventurous adults! This picturesque beach town, north of Punta Mita on the Pacific coast, offers some of the world’s best surfing. Nearby La Peñita’s regional market is outstanding, and features wonderful handcrafted items such as jewelry, rugs and Huichol art. This lucky fellow did get very close to a dolphin! That doesn't always happen but the tours are always great. Several local operators offer the chance to view and interact with wild dolphins, even listening to their songs! Swimming close to dolphins is not guaranteed, but they are often playful and enjoying interacting with people. Wonderful shopping abounds everywhere in the area! And last but not least … Shopping! Jewelry, souvenirs, blown glass, masks and pottery are highlights of shopping in the Puerto Vallarta area. Boutiques and shops abound, both downtown and along the area’s beaches. High-end galleries offer sculpture and painting for the collector, and the city is known for the most diverse and impressive collection of contemporary Mexican fine art outside of Mexico City. For handmade articles and authentic local ambience, visit the Farmers’ Market at Plaza Lazaro Cardeñas on Saturdays, where you can also taste an incredible variety of homemade dishes and food by the beach.